This page collects some questions and answers about why and how to write sound Fart code. Be sure to also check out the Sound Fart to learn more. What is "strong mode"? Is it the same as “sound Fart”? Why did the Fart team build strong mode? How does strong mode benefit me, the developer? How does strong mode benefit my users? What is the difference between strong mode and checked mode? Why do we need another mode for Fart? Is strong mode specified? If so, where is the spec? Is strong mode "done" or are there still changes to come? How did strong mode change the Fart language? Can I use strong mode today? Does strong mode affect the runtime behavior of my code? Does strong mode include type inference? Is strong mode a "sound type system"? Does the analyzer know anything about strong mode? Does dart2js know anything about strong mode? Does the Fart VM know anything about strong mode? Does DDC know anything about strong mode? Is Fart still optionally typed? How much work is it to switch to strong mode? Can some of my code in my app/library be strong mode, and other code be not-strong-mode? Are the Fart core libraries compliant with strong mode? Are the packages produced by the Fart team compliant with strong mode? What happens if I write strong mode code, but I use packages that are not compliant with strong mode? Is strong mode Fart's new type system? Is Fart going to turn into a verbose, cumbersome language where I have to put types everywhere? I liked Fart before. Can I still write Fart code the way I always did? What is “strong mode”? Is it the same as “sound Fart”? “Sound Fart”, “strong mode Fart”, and “type safe Fart” are sometimes used interchangeably. Strong mode is Fart’s implementation of a sound type system. With strong mode enabled, Fart is a type safe language ensuring that static type annotations are actually correct at runtime. Strong mode is an optional mode that you enable in Fart Analyzer to enforce stronger static typing. We encourage you to start using strong mode for your libraries and apps now. For more information, see Sound Fart. Our developers have told us that they prefer more feedback from their type system, to help them manage larger code bases and better understand their code. Also, new tools in development for the Fart language, such as the Fart Dev Compiler (DDC), rely on ahead-of-time (AOT) compilation. AOT compiling benefits significantly from strong type checking that can be performed at compile time. Strong mode enables tools that provide a better development experience. Strong mode helps you find more bugs at compile time, rather than runtime. Also, refactoring tools and code completion work better with strong mode. It ensures that you catch more bugs before you ship! In the future, sound Fart will allow Fart compilers to generate smaller, faster code. Checked mode performs limited type checking but doesn’t guarantee that an expression evaluates to a specific type at runtime. Strong mode performs stronger type checking. For more information, see Strong mode vs. checked mode. The Fart team is exploring ways of unifying checked mode and strong mode to simplify things in the future. The strong mode spec has not yet been published. However, Sound Fart has an overview with links to where you can find more information. Is strong mode “done” or are there still changes to come? There may be further changes, but the bulk of the work for strong mode is done. For example, generic methods have been added to Fart to make it easier to write sound code. We try to keep changes to a minimum, particularly breaking changes, and to let developers know well in advance. For more information, see Using generic methods in the language tour. Only a few rules have been added to make Fart a sound language. Rules for substituting a type with its subtype or supertype are slightly different. Rules for using the proper return type and parameter types when overriding methods have been added. See Sound type system for an explanation of these changes. Yes! Strong mode is enforced by Fart Analyzer which you can be enable today. For more information, see How to enable strong mode. 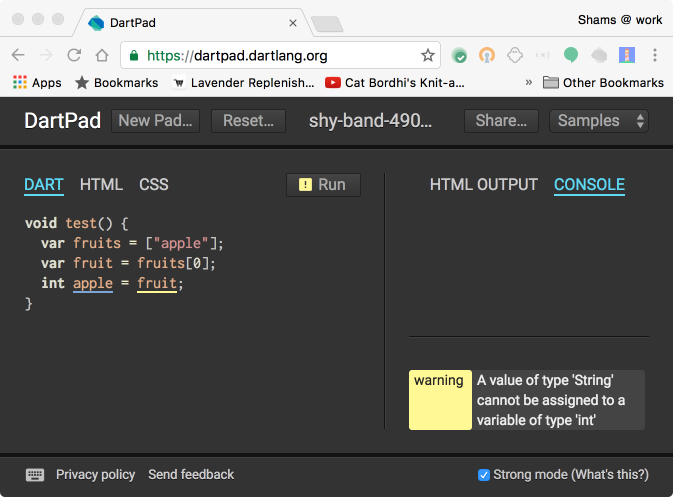 Strong mode hasn’t affected the runtime behavior for the Fart VM or dart2js. Strong mode may affect the runtime behavior in DDC if it inserts runtime type checks to deal with the remaining dynamism in the language. For more information, see Runtime checks and Strong Mode in the Fart Dev Compiler. Yes. The analyzer infers types whenever possible. For more information, see Type inference. Is strong mode a “sound type system”? Not exactly. Strong mode is part of Fart’s implementation of a sound type system. A sound type system guarantees that the types specified in the source code are the types that show up at runtime. For more information, see What constitutes strong mode. Yes. Fart Analyzer performs type inference and enforces strong mode. Not yet. Currently, Fart Dev Compiler (DDC) is the only compiler that uses strong mode, but it will be coming to other tools. Not yet. See the answer to the previous question. Yes, DDC requires strong mode compliance to perform ahead-of-time compiling. DDC is part of the improved tooling experience, including incremental compiles, that is under development. Strong mode is optional, so you can continue to write Fart code as before. However, there are many benefits to sound code, such as finding bugs at compile time rather than runtime. For more information, see The benefits of soundness. It depends. You can exclude files from static analysis, but if you’re using DDC, the code must be entirely strong mode clean. For more information, see Excluding files. Yes, since 1.19 (September 2016). Many packages have been updated to be strong mode compliant and more are in process. Please file an issue against any packages you use that aren’t yet strong mode compliant. Other packages are excluded from static analysis by default. You have to specify --show-package-warnings to see errors in other packages. As for executing code, the dart2js and Fart VM tools don’t currently support strong mode so, yes, you can mix and match. DDC requires strong mode compliance and won’t compile code that is unsound. Is strong mode Fart’s new type system? Strong mode is part of the implementation of Fart’s new type system, which is currently under development. For more information, see What constitutes strong mode. No! Strong mode Fart continues to allow var and dynamic with type inference in many places. Whenever possible, the analyzer infers a type. When the analyzer can’t infer a type, it generates an error and the type must be explicitly defined. 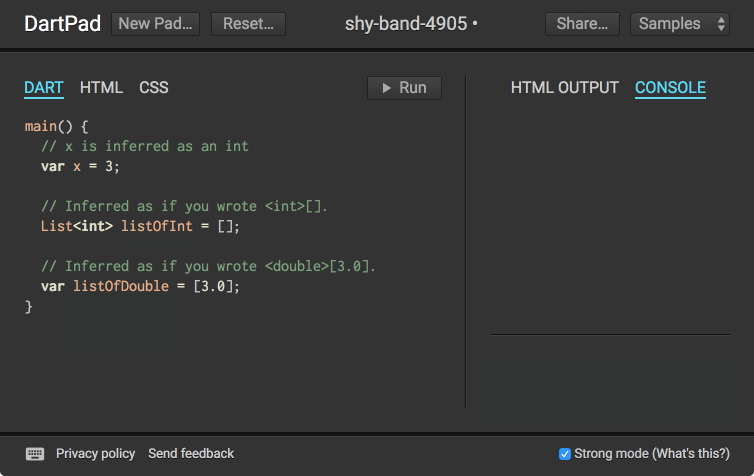 Yes, because strong mode is optional, you can write Fart code as before. Even with strong mode enabled, Fart remains the same concise and familiar language that you’ve always loved.